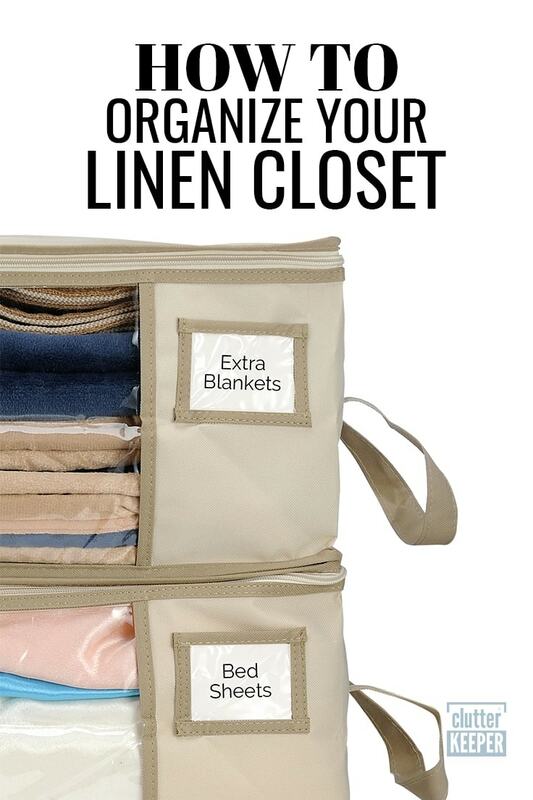 Is your linen closet storage packed with bedding, bath towels and more? 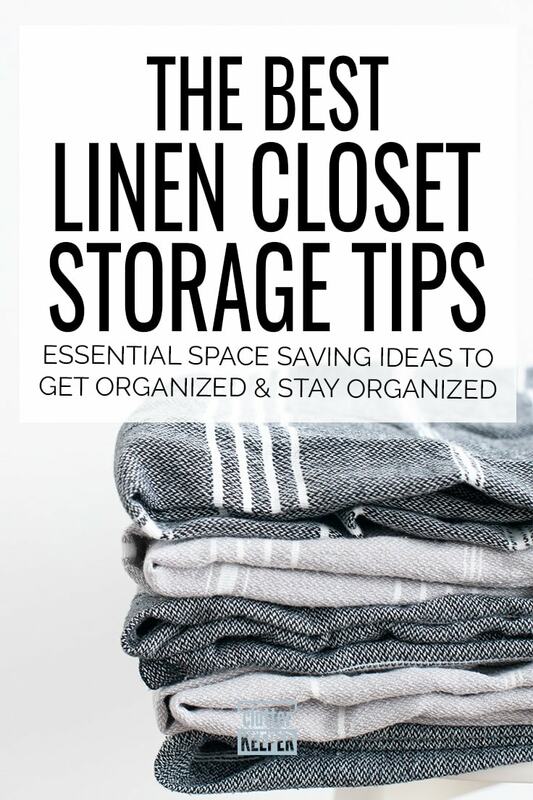 You need these organizing tips for how to create more storage in your linen closet. Doesn’t it feel like no matter how many times you reorganize your linen closet there isn’t enough space to fit everything? Despite our best organization efforts, linen closet storage is just a common problem. If you have limited room, or just need more storage for bedding and towels, here is how to create more space in your linen closet. One of the best ways to add extra storage is to add additional shelving! Look for a shoe organizer, or even just an additional shelf to create more shelves for you to use! The problem with shelving isn’t usually the height, but the lack of space. If you have a lot of tall items in your linen closet this might not work well, but if you’re looking to find more space for toiletries and other small items, this hack is perfect! You don’t want to put just any old bin in your linen closet. Look for the ones that are used for pantries and fridge organizers. These tend to be a little smaller, but they are perfect for adding some additional storage space without taking up a lot of room! Since they are used to hold food, they come in all sorts of different shapes and sizes! If you have a lot of vertical space left on your shelves, consider adding stackable bins. They’re easy to access when you need them, and you can fit more in a small space. Put your sheets into the pillowcase and store them as a single unit. Use a file organizer to create a stackable compartment for smaller items. Roll your towels instead of folding them to cut down on space. 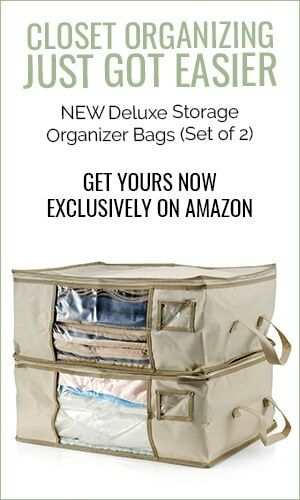 Store out of season linens, extra blankets and towels in large stackable storage bags. The Clutter Keeper Deluxe Storage Bags have clear front panels and label pockets so you can easily see what’s inside. Don’t be afraid to think outside of the box to come up with something that works perfectly for your needs. 4. Use your door space! Your door is precious real estate! An over-the-door organizer, mounted bins or baskets, or even command hooks can allow you to use your door as additional storage space. Keep items that you use frequently and need to access quickly here to make it easier to get to. You want to keep the items you use most frequently front and center. This last tip might sound stupid, but this might be so obvious that you missed it! If you are short on storage, then you might be storing too many items in your linen closet that don’t need to be there. Towels can be stored in the bathroom using a wine rack, and washcloths can easily be stored under the bathroom sink or in a creative display on the counter. Cleaning supplies can be stored in a utility closet. If you are pressed for space and can’t find enough storage solutions, it may be time to move things around. No longer do you have to cram everything in your linen closet just to get everything to fit. Now, you’ll have even more storage than you could ever imagine! Now that you tried those 5 ideas, here are 6 more linen closet organization tips that you’ll be glad you found. 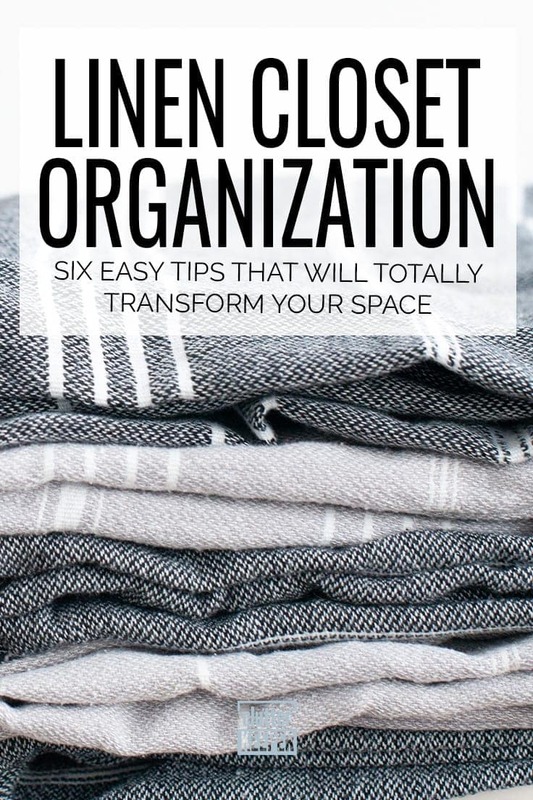 Now let’s explore no-brainer linen closet organization tips that will transform your space – no matter how small or roomy it is. So, what is your biggest struggle with linen closet organization? Do you have the most trouble fitting everything inside? Or does your linen closet become a junk closet – holding everything that doesn’t have a home? Let’s tackle all your linen closet organization struggles and find some ideas that will transform how you use this very important area. First, let’s look at what you store in your linen closet, then move onto how to organize your home’s essentials. The first thing you have to decide is what you are going to store in your linen closet. This depends on how much room you have and how many closets you have in your home. If you have a small closet, only store items you use daily. If you have extra room, you can also store extra soaps and toiletries inside as well. 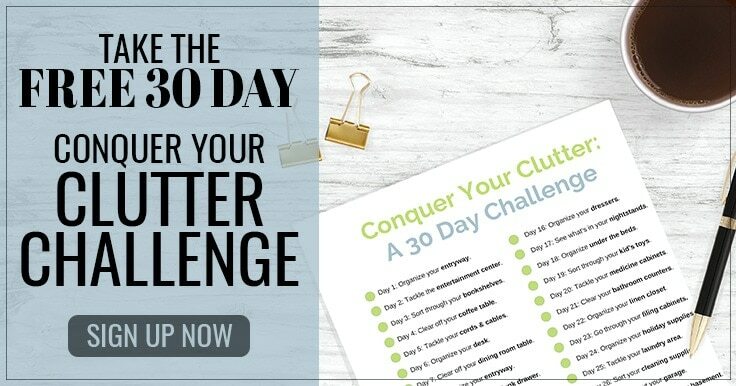 After you know what belongs in the linen closet, sort through everything in there now and throw away or give away anything you don’t use or don’t need. If you have items that are used once or twice a year (seasonal items), try to box them up and store them somewhere else. If you are storing something “just in case” and haven’t used it in the past few months, don’t keep it. Removing unused items will keep your linen closet organized longer. It also gives you more space to store all the items you currently need and use. Don’t continue to store the things you no longer use. Don’t hold onto items for a rainy day. Keep your home free of stuff you don’t use so your thoughts are clearer and you can find what you need when you need it. Pillowcases provide the perfect storage solution for small linen closets. Storing sheet, pillow and blanket sets will keep your closet looking simply clean. It also saves you time when you want to change sheets on a bed. Just grab the set inside the pillowcase and you have the entire set in one place. All of your sheets and pillowcases will fit inside one pillowcase easier if you fold the fitted sheet correctly. This is the most annoying part of every linen closet! But, with a little practice, it can be done. This video shows you step-by-step how to fold a fitted sheet. It is the easiest to follow and will give you confidence as you tackle this task from now on. Next, keep your linen closet staying organized for longer by preventing your stuff from falling over by storing them in deep bins. It’s one thing to spend all day cleaning out your linen closet, but it is extremely frustrating to see all your hard work go to waste as your linens fall on top of each other. Deep bins provide structure, keeping loose items in one place. They also give you the option of labeling them with a label maker, so you can quickly grab exactly what you need without sorting through piles of other things. Another way to organize your bins or shelves is by the room or category. Keep all your towels on one shelf, your sheets on the next shelf, and so on. Anything you can do to minimize the time it takes to find the items you need will help you stay organized and encourage you to keep it organized in the future. Finally, if you have a really small linen closet, use this space-saving hack: roll your towels. Rolling saves space compared to folding them. Rolling your towels also has the added benefit of enhancing the look and feel of the closet. It just looks prettier and more put-together when they are rolled and placed on one-another. Ready to tackle your linen closet? Use one or all of these ideas and transform your small space into the cleanest and more organized closet in your home. Check out How to Organize Your Linen Closet Once and For All for even more linen closet organization help. Now that you have your linen closet storage problems solved, here are some more organization tips and tricks. Complete Guide to Living Room Organization – Ready to tackle your living room next? Start here. 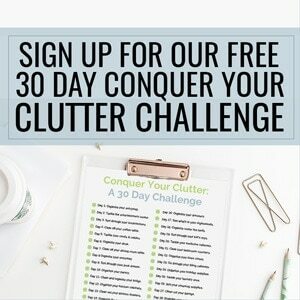 30 Day Conquer Your Clutter Challenge – We take you step by step to conquer all that clutter in just minutes each day. Kitchen Pantry Organization in 6 Steps – Create a clean and tidy pantry in no time.